For me, railfanning the Selkirk and Mohawk Subs on CSX’s Chicago Line on a Monday in September proved to be ALL about missing trains. Barely any morning intermodals, then 5 trains going through in a 10 minute interval while I was on the road parallel to the tracks trying to find my way to the bridge over the Mohawk River. THEN you get that shot thats just about worth EVERYTHING. Here, two UP’s sandwich an ex-SP AC4400CW leading a loaded ethanol train east through Rotterdam Junction NY. This train will cross the Mohawk River and continue its way east on the Selkirk Sub to Selkirk Yard, where it will most likely be routed south down the CSX River Line to points in New Jersey. 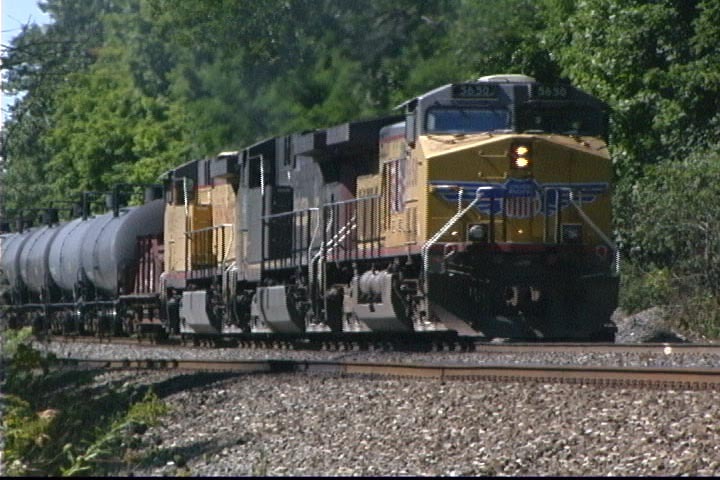 Shot on the CSX Mohawk Subdivision in Rotterdam Junction, NY on 9/1/08 by Mike Antal.